*Since I write Scottish Romance novels, I naturally had to write about Robert the Bruce and his second wife, Elizabeth de Burgh. More so after I watched Outlaw King on Netflix. In truth, I didn’t like it and my love for Chris Pine couldn’t even save it. I felt that the flick only touched on the man who became King of Scots. No matter the movie, Robert the Bruce captured my interest years ago. I even included a Bruce relation in my upcoming Scottish historical romance novella The Chieftain’s Secret and now is the time I can write about this historical couple. Robert the Bruce or Robert de Brus was of Anglo-Norman and Gaelic nobility as well as the Earl of Carrick. He was the fourth great-grandson of David I, King of Scotland. As the saying goes, his blood ran blue. Through this line, he had a claim to the Scottish throne after the death of Alexander III. He wasn’t the only one though. The Scottish nobility and Edward I of England bestowed the Scottish crown on the head of John Balliol though he wouldn’t remain king for long. Robert had been married before to Isabella of Mar who died birthing their daughter, Majorie Bruce. 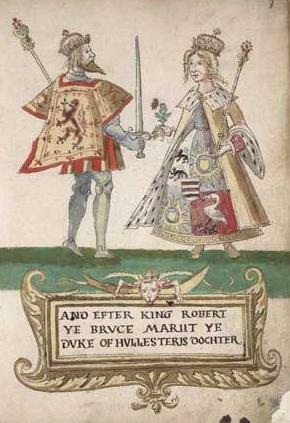 During William Wallace and Andrew Moray’s battle against Edward I, Robert was among those that battled the English for Scottish Independence. In September 1298, when William Wallace resigned as Guardian of Scotland, Robert the Bruce as well as John Comyn, Lord of Badenoch another claimant to the Scottish throne as well as William Lamberton, Bishop of St. Andrews were appointed to that rank. Bruce wouldn’t hold the position for long. He resigned in 1300. It seems that he and Comyn couldn’t get beyond their differences or most likely dislike of each other. By 1302, Robert and his family made “peace” with Edward I as they were rumors that John Balliol would reclaim the Scottish throne. It was also this year when he would wed his second wife—Elizabeth de Burgh. Elizabeth de Burgh was born in 1284 in Ireland and was the daughter of one of the most powerful Irish nobles—the 2nd Earl of Ulster, Richard de Burgh and his wife Margarite de Burgh. Much is not know about her life but she was about eighteen and Robert twenty-eight when they wed. Most likely their marriage was not a love match but one of politics. Robert’s father was an ally and friend to Edward I as well as Elizabeth’s own father. The marriage was most likely also arranged to help Edward retain an ally in Scotland. Don’t think that peace existed between Scotland and England during these times. There was still unrest and bloodshed and much distrust on both sides. Four years after their marriage, Robert slain John Comyn in the Chapel of Greyfriars Monastery in Dumfries. Now Bruce was excommunicated for his crime. However, he was given absolution from the Bishop of Glasgow. Now, Bruce claimed the crown of Scotland. On the 25 of March 1306, Robert the Bruce had the Scottish crown placed on his head. Elizabeth became his queen consort. But this couple couldn’t have a quiet time, there were still English to be fought and banished from Scottish lands. In June of 1306, Bruce was defeated at the Battle of Methven. Robert placed his wife, his sisters and his daughter’s protection to his brother Niall Bruce who journeyed to Kildrummy Castle. Robert fled and went into hiding. At Kildrummy, the English laid siege. The Bruce ladies escaped while every man including Niall Bruce was hanged. Elizabeth along with the others took protection at St. Duthac at Tain. But the Earl of Ross imprisoned them and informed Edward. Elizabeth was imprisoned in harsh conditions in England. She was moved from castle to castle. Meanwhile, Bruce was waging war against the English. It would take eight years for Elizabeth and Robert to be reunited. During this time, Edward I died and his son Edward II became King of England. Bruce waged war and on the 24 of June 1314, the Battle of Bannockburn was fought. The Scottish and Bruce won their independence. In November of that year, Elizabeth was finally reunited with her husband in a prisoner exchange. Elizabeth and Bruce would have four children together—Matilda, Margaret, David II of Scotland and John of Scotland. All their children but John (died in infancy) grew to adulthood. How their relationship was? I imagine that they grew to have tenderness and perhaps love. Elizabeth withstood eight years of harsh imprisonment. Robert must have known that and had a respect for her at the very least. At around forty-three years of age, Elizabeth died on 27 October 1327 at Cullen, Banffshire. She was buried at Dunfermline Abbey. Eighteen months later, Robert followed his queen to the afterlife at the age of fifty-five. *This post was meant to upload in early November but I got sick so it’s late. In 1986 the MTV hosted the Video Music Awards—the VMAs—my eleven-years-old self probably watched it. Now in 2018, I cannot be bothered to watch the VMAs, Grammys or the other award shows. I’m not going to waste hours on something that bore me to death. But back then, I loved nothing more than Norwegian pop group A-ha. The comic book style animated video blew everyone’s head away and the song was and is great. These many decades later, I still listen to it and feel excited, want to dance and can’t help but sing along. Enjoy and try not to bob your head to the beat. NO! I do not want to write what I know. Writing for me is about escape into another life, world, person. I read that way too. I want to experience so many lives—the hopes, the loves, the aches and the dreams. What I know is my everyday life and while some people love to explore everyday reality, that is not my thing. I want to fall in love with the handsome duke, dance at the ball, and be a lady-in-waiting to a Tudor queen. What is the worst advice you received? Do share so we can complain about it then stick out our tongue at it. Welcome to my new website! Thanks for checking it out. 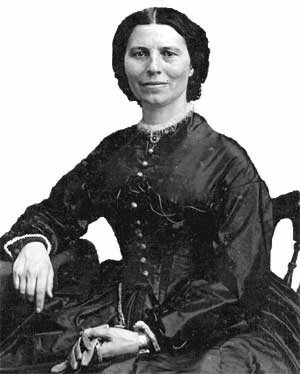 With the tornadoes carving a path of destruction in the Untied States and with the 150th Anniversary of the Civil War, only one female deserve to be remembered on Female Friday: Clara Barton. On Christmas Day in 1821 in Oxford, Massachusetts, Clarissa Harlowe Barton was born. Clara as she became know was one of five children. At 11, she received her first patient, her brother David. For three years she cared for him and that started her life in nursing. Almost three decades later, her nursing skills helped the men fighting against their brothers in war. Nine days after the start of the Civil War, Clara tended the soldiers quartered in the US Senate chamber in Washington. She was dedicated to these injured men so much so that after the first Battle of Bull Run, she established a main agency to obtain and distribute supplies. Even that wasn’t good enough for her. She was then given a pass to ride in army ambulances to provide comfort and nurse the injured back to health. With the end of the war, in 1865, President Lincoln placed her in charge of the search for missing union men. A daunting task but one she gave her all to. As luck would have it, a young soldier named Dorence Atwater came to her. He had a list of 13,000 deceased Union men. Atwater had carried this precious list through his time in the Andersonville prison. The list became known as The Atwater List as Clara Barton named it in her official reports. Both Atwater and Burton sent 42 headboard carvers to Andersonville and became known as the Angels of Andersonville, which was her second nickname. The first was The Angel of the Battlefield. She became a celebrity in her time with her lectures seen by the populace, meeting with Susan B. Anthony on Women’s rights and as well as Fredrick Douglas about Black’s rights. 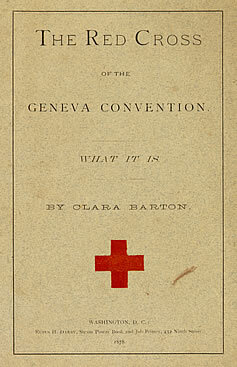 In 1869, she learned about the Red Cross and Henry Dumant’s Book, A Memory of Solferino, during her trip to Geneva. On May 21, 1881 in Dansville, New York, Clara became the president and founder of the American branch of the Red Cross or the American Red Cross. To continue helping people in need, she sailed to Istanbul and opened the first American International Red Cross. Her works continued in Armenia as well as hospitals in Cuba. Needing funds to continue her works, she teamed up the New York World Newspaper to accept contributions for relief efforts. Nowadays, we text in our donations. Her last field operation was the relief effort for the victims of the Galveston Hurricane, the deadliest in US history in September 1900. She resigned four years later at age of 83. On April 12, 1912 at the age of 90, she died in Glen Echo, Maryland, which is also the location of the Clara Barton National Historic Site. The Red Cross still serves this nation in every tragedy we have suffered. And it’s one of the greatest services this nation has. Not to preach but if you can give $1 or 5, or whatever you can, please do and help people get back to their normal lives. And if you did as an American, I thank you. I didn’t watch the Golden Globes but the press is all stirred up by the comments Ricky Gervais made as the host. And Ricky said that after this broadcast, the Hollywood Foreign Press wouldn’t invite back as a host. For me, I love Ricky Gervais. When I first watched Office, I was captivated by the show. I don’t watch the US version. However, I get my Ricky Gervais fill by watching his show on HBO The Ricky Gervais Show. I must admit I love to hear Ricky laugh that high-pitched squealing laugh. I can’t help but join in. But there are funny comments from Stephen Merchant and Karl Pilkington as well. With the second season just an episode in, I say watch it if you want to waste time or just want to have a good laugh. I’ve been lax with my postings, not having written one since Halloween. I would like to say that I didn’t have the time but the truth was I didn’t have the heart. Since my grandmother’s death in October, my juices needed to be recharged. However, I don’t think grief was the only reason because stories still raced through my head. I can’t really pinpoint why I didn’t give my blog the attention it deserved. The worst part of this whole ignoring-my-blog-thing was that I vowed when I started not to let it fall forgotten on the roadside of the super highway. However, it’s a new year and a new look for my blog. Does that mean that I’m changed? No way in cyberspace. For me, midnight came on Jan. 1 and I felt that rush of emotion at the new year and the hope and promise that awaited and bittersweetness at what had been left behind. Then a couple hours after midnight [as I stayed up watching Doctor Who] the air around me felt like any other day. So this year, there will be no resolutions. I refuse to start the year trying to change who I am or making useless vows that will be forgotten by January 6. I’m just going to keep being me. After all, I have people in my life who love me just the way I am. [Much like Mark Darcy loves Bridget Jones] Oh, I’m still going after my goals and will make them happen. But I’m not going to start exercising. I’m not giving up chocolate. I’m not going to go to church every Sunday. If you, dear reader, have someone who loved you before Jan 1, forgot those damn resolutions because love is never wrong. Be you! Shut off the lights, curl up on the sofa under your Snuggie Blanket, have your bowl of popcorn close, keep the candy for yourself and lose yourself in my Halloween Movie Top 10 list.